Time for Whisky.com: The Balvenie x Blue Butcher Valentine's Day Dinner: "An Edible Story of Whisky Making"
The Balvenie x Blue Butcher Valentine's Day Dinner: "An Edible Story of Whisky Making"
For Valentine's Day this year The Balvenie have teamed up with Sheung Wan institution (and temple to all things meat) Blue Butcher to bring diners an "Edible Story of Whisky Making" - a 4-course menu featuring Balvenie-infused ingredients echoing 4 stages of whisky-making. 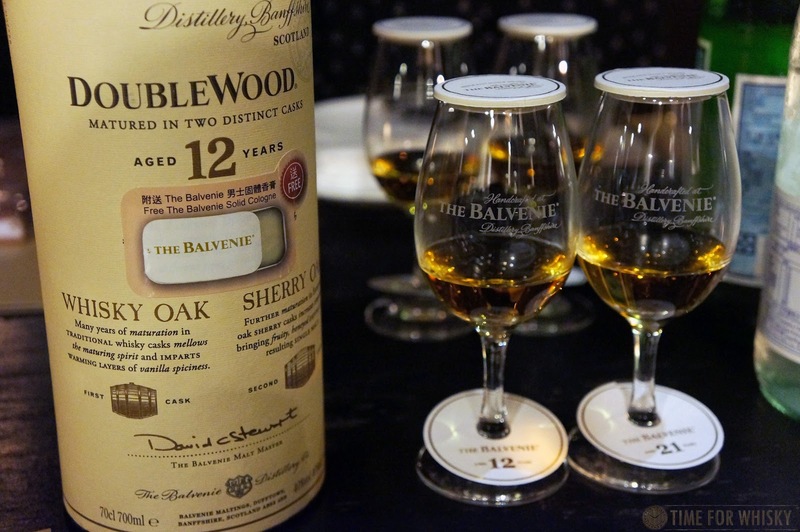 Paired with 4 whiskies from The Balvenie (12 Doublewood, 14 Caribbean, 17 Doublewood and 21 PortWood), the menu is available only on Valentine's Day and costs just $520HKD/head. A few nights ago I had the pleasure of trying two dishes from the menu, paired with two drams of The Balvenie. First was The Balvenie & Earl Grey smoked salmon with creme fraiche, charred eggplant, roasted nuts and puffed barley paired with The Balvenie DoubleWood Aged 12 Years. Designed to echo the malting process, the dish contained crunchy barley pieces which made for a nice textural counterpoint to the soft salmon, as well as providing a slight nod to The Balvenie being one of the few Scottish distilleries still with its own malting floor. Next was the gargantuan The Balvenie 21yrs aged Grass Fed Australian sirloin with Hollaindase sauce and aged fat roasted potatoes, paired with The Balvenie 21 PortWood. Easily a whole meal in its own right, the theme here was "maturation" - with the sirloin having been aged in Blue Butcher's special drying room for extra rich flavour. The Balvenie 21 PortWood might seem like an interesting choice (it's more commonly paired with dessert), although it worked well here, bringing out a sweetness to the meat. Whilst we didn't try the other two courses (the full menu can be found below), what we did try was more than enough to confirm that this meal should make any whisky-loving couple happy, and at $520HKD/head? Bargain. Those looking to further the whisky-theme for Valentine's Day could do worse than gifting a bottle of The Balvenie 12 DoubleWood too - which for a limited time and at certain retailers will come with a solid cologne "inspired by the key notes in The Balvenie 12 DoubleWood". Don't worry, it doesn't make you smell like you've bathed in whisky, but it does have nice fruity honey notes. The Valentine’s Day menu is only available on the 14th February 2019. 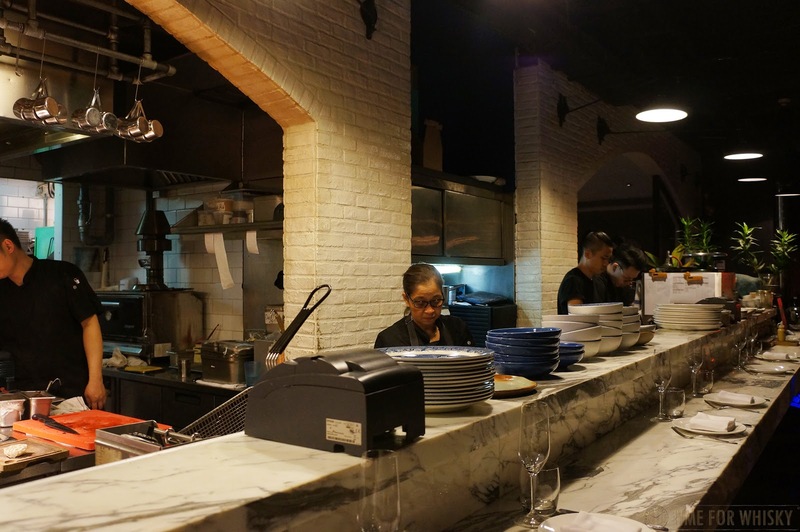 Reservations can be made via e-mail to reservations@bluebutcher.com. TimeforWhisky.com attended as a guest of Telford Wine & Spirits and Maximal Concepts. 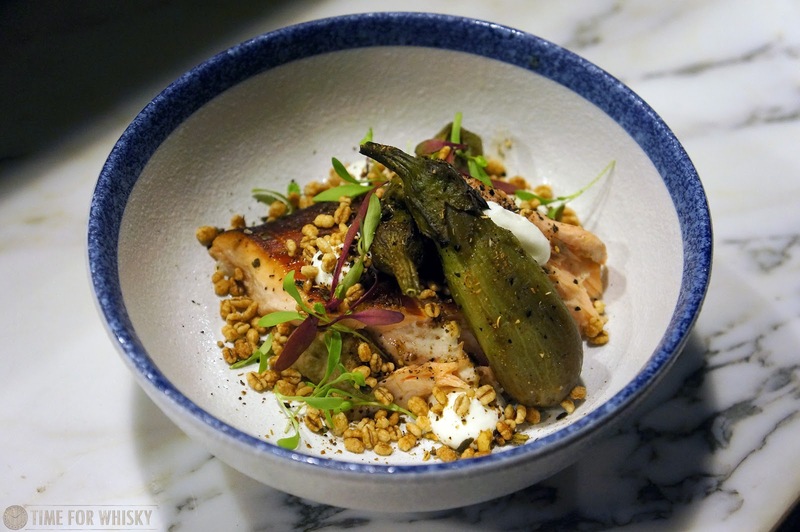 "The first step is called Malting, introducing the starter The Balvenie & Earl Grey smoke salmon with creme fraiche, chard eggplant, roasted nuts and puffed barley paired with The Balvenie DoubleWood Aged 12 Years. The barley grain is stepped in water, germination will turn the starch in the barley grain into sugar. The Balvenie’s malt men will regularly turn the barley by hand using a wooden shovel to ensure the grains germinate equally. It is one of the few distilleries to still operate a malting floor. The second step is Fermentation, using Buffala burrata with kalamata tapenade, charred baby fennel, fermented melon and arugula. Post malting, the barley is dried in the kiln then milled. Hot water is added 3 times to extract out the sugar and yeast is added to the cooled down sugar solution. The fermentation process will produce a liquid with alcohol content of around 6-8% known as “wash”. The fermented melon exact echoes the fermentation process in whisky making. This crafted dish is a perfect match with The Balvenie Caribbean Cask Aged 14 Years. To refresh the taste buds, the third step is Distillation. The “wash” is distilled 2 times in copper pot stills into a new make spirit of 60-70% alcohol content. The shape of the pot stills in is a key contributing factor to style of the whisky. 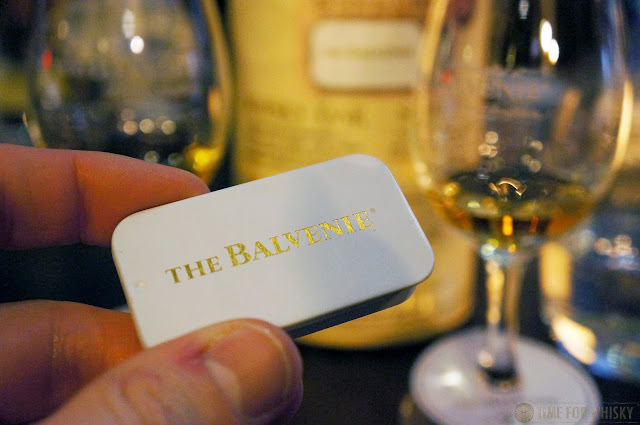 The Balvenie employs its own team of coppersmiths to maintain this important asset. Refreshing Citrus Zest Sorbet is paired with The Balvenie DoubleWood Ages 17 years to set your dinner into the spotlight of the main course. The sorbet is created using a distillation process to extract citrus concentrate. Maturation is the forth step of whisky production, and Blue is demonstrating this important process with The Balvenie 21yrs aged Grass Fed Australian sirloin with Hollaindase sauce and aged fat roasted potatoes. The meat aging process is carefully monitored by the Chef just as The Balvenie’s Malt Master, David Stewart MBE watches over his whiskies. The new make spirit is put into oak barrels for maturation. The type of casks selected for maturation is the key factor which affects the flavours of the whisky. Each year around 2% evaporates, as some calls it “Angel’s Share”. David is skilled at using different types of wood to create unique flavours for each expression of The Balvenie. 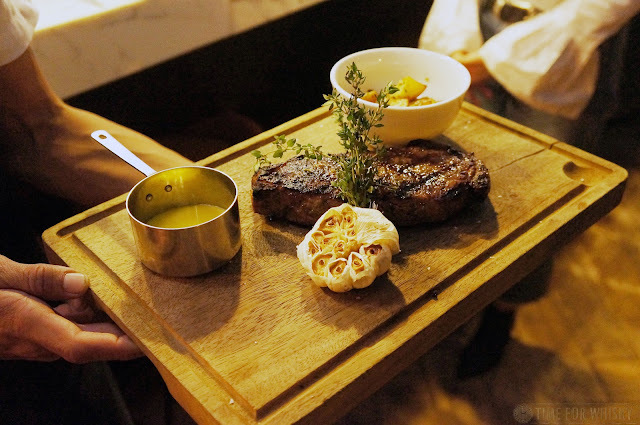 The succulent steak is paired with The Balvenie PortWood Aged 21 Years to enhance the savoury experience. To make a great ending to this romantic night, Blue presents Dulce De Leche Rocher with apple pie and The Balvenie infused chocolate sauce with hazelnut on top. Which will definitely wrap up the dinner with a sweet touch, enjoying The Balvenie PortWood Black Cherry Flip specially created by our in house mixologist."